Barcelona (AFP) – More than 2,300 polling stations are ready for the Catalan independence referendum slated for Sunday but banned by Madrid, the regional separatist government said Friday. Spokesman Jordi Turull told reporters there would be “2,315 polling stations all over the region” and more than 7,200 people involved in holding the referendum despite a crackdown by Madrid. “A total of 5.3 million Catalans who have the right to vote are called to vote,” he said. At the end of the press briefing, Turull, Catalan Vice-President Oriol Junqueras and Raul Romeva, in charge of foreign relations for the Catalan executive, unveiled a plastic ballot box with a regional government stamp on it. Police have for days been seizing electoral items such as ballot papers as they follow orders to stop the referendum from taking place, after courts ruled it unconstitutional. 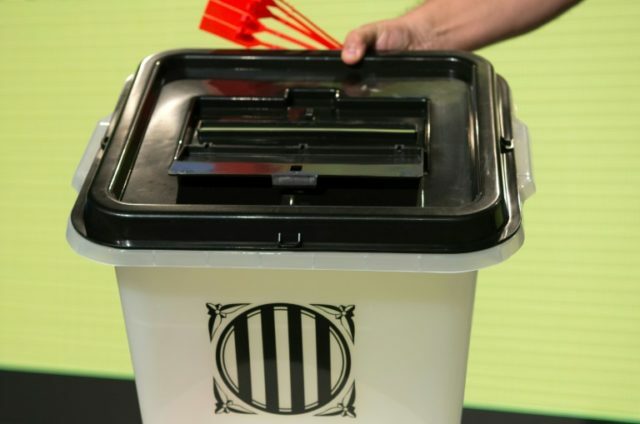 But they had failed to find any ballot boxes until Thursday, when police seized 100 from a warehouse in a Catalan town, although the company in charge alleged they were destined for internal elections at the FC Barcelona football club. Over the past few days, judges and prosecutors have also ordered the closure of websites linked to the vote and the detention of key members of the team organising the referendum. Opinion polls show Catalans are split on the issue of independence, but a large majority want to vote in a legitimate referendum to settle the matter. And Catalonia’s separatist executive has vowed to go ahead despite Madrid’s ban. Junqueras told reporters that if “someone closes a polling station, there is an alternative for citizens to vote,” without giving further details.